The 908M delivers high performance with outstanding versatility with on-the-go operator tuned hydraulics and drive train adjusts the machine’s response to the task at hand. A large, spacious cab provides with low sound levels and the intuitive controls keeps you working comfortably all day long. An electronically controlled hydrostatic transmission provides adjustable power to the ground and superb groundspeed control for fast digging cycles and the flexibility to efficiently perform a multitude of tasks along with high, full turn tipping loads and breakout forces, the M Series delivers a solution for all customer applications. State of the art electrohydraulic system provides low effort, fine control with fast cycle times. The all-in-one joystick helps keep eyes on the work. Machine responsiveness can be adjusted with the push of a button, which allows you to set up the machine exactly the way you want it based on the application. • Low effort, responsive joystick includes Forward/Neutral/Reverse switch, optional diff lock, continuous flow triggers with proportional, third function hydraulics. • Easy access to the cab with ergonomically placed grab rails, steps and large platform. • Low sound levels. • Superb visibility to the work tool due to the wide windshield and Optimized Z-bar Loader. • Optional air conditioning with defrost/demist. • Optional heated, air suspension seat with lumbar and seat back tilt adjustment. 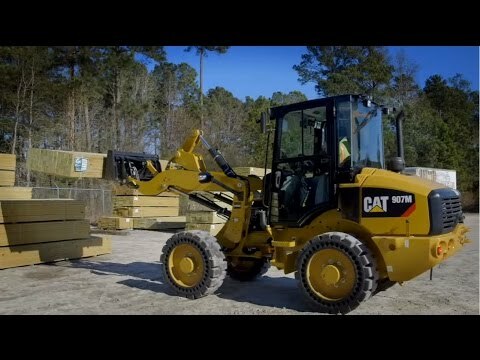 The Cat Optimized Z-bar Loader combines the digging efficiency of a traditional Z-bar with tool carrying capabilities for great performance and versatility. • Parallel lift and high tilt forces throughout the working range help you safely and confidently handle loads with precise control.• Linkage features excellent visibility to the bucket cutting edge and fork tips. Note (6) Stage V engine available for Europe only. Stage V engine available for Europe only. Note (7) Tier 4 Final engine will be offered for North America and Japan. Tier 4 Final engine will be offered for North America and Japan. Note (8) Tier 4 Final machines will not be offered or sold into Europe. Tier 4 Final machines will not be offered or sold into Europe. Emissions *The Cat C3.3B DIT engine meets U.S. EPA Tier 4 Final/EU Stage V emission standards or Tier 4 Interim/Stage IIIA equivalent emission standards. *The Cat C3.3B DIT engine meets U.S. EPA Tier 4 Final/EU Stage V emission standards or Tier 4 Interim/Stage IIIA equivalent emission standards. Note (1) Net power ratings are tested at the reference conditions for the specified standard. Net power ratings are tested at the reference conditions for the specified standard. Note (2) Net power shown is the power available at the flywheel when the engine is equipped with alternator, air cleaner, diesel exhaust filter, and fan at minimum speed. Net power shown is the power available at the flywheel when the engine is equipped with alternator, air cleaner, diesel exhaust filter, and fan at minimum speed. Note (3) No derating required up to 3000 m (10,000 ft) altitude. Auto derate protects hydraulic and transmission systems. No derating required up to 3000 m (10,000 ft) altitude. Auto derate protects hydraulic and transmission systems. Note (4) Flywheel per the SAE reference conditions with the fan at maximum speed. Flywheel per the SAE reference conditions with the fan at maximum speed. Note (5) The Cat C3.3B Tier 4 Final/Stage V uses an active regeneration system which requires no operator interaction under normal conditions. The Cat C3.3B Tier 4 Final/Stage V uses an active regeneration system which requires no operator interaction under normal conditions. Note Specifications shown are for a machine configured with general purpose buckets, bolt-on cutting edges, 75 kg (165 lb) operator, Dunlop 405/70 SPT9 tires, full fuel, comfort EROPS cab, standard flow hydraulics and skid-steer coupler. – 908M is configured with a 1.1 m³ (1.44 yd³) bucket with bolt-on cutting edge. Specifications shown are for a machine configured with general purpose buckets, bolt-on cutting edges, 75 kg (165 lb) operator, Dunlop 405/70 SPT9 tires, full fuel, comfort EROPS cab, standard flow hydraulics and skid-steer coupler. – 908M is configured with a 1.1 m³ (1.44 yd³) bucket with bolt-on cutting edge. Note (1) *Vary with bucket. *Vary with bucket. Note (2) **Vary with tire. **Vary with tire. Note (3) Dimensions listed are for a machine configured with general purpose buckets, bolt-on cutting edges, 75 kg (165 lb) operator, no air conditioner and Dunlop 405/70 SPT9 tires. Dimensions listed are for a machine configured with general purpose buckets, bolt-on cutting edges, 75 kg (165 lb) operator, no air conditioner and Dunlop 405/70 SPT9 tires. ROPS SAE J1040 MAY94, ISO 3471-1994. SAE J1040 MAY94, ISO 3471-1994. FOPS SAE J/ISO 3449 APR98, Level II, ISO 3449 1992 Level II. SAE J/ISO 3449 APR98, Level II, ISO 3449 1992 Level II. Note (1) Cat cab and Rollover Protective Structures (ROPS) are standard in North America and Europe. Cat cab and Rollover Protective Structures (ROPS) are standard in North America and Europe. Note (2) When properly installed and maintained, the cab offered by Caterpillar, when tested with doors, and windows closed as per work cycle procedures specified in ISO 6395 2008, results in operator sound exposure Leq (Equivalent sound pressure level) of 66 dB(A) typical. 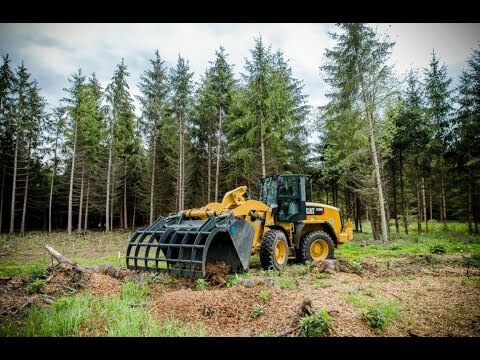 When properly installed and maintained, the cab offered by Caterpillar, when tested with doors, and windows closed as per work cycle procedures specified in ISO 6395 2008, results in operator sound exposure Leq (Equivalent sound pressure level) of 66 dB(A) typical. Note (1) Other tire choices available, contact your Cat dealer for details. Other tire choices available, contact your Cat dealer for details. Note (2) In certain applications, the loader's productive capabilities may exceed the tires' tonnes-km/h (ton-mph) capabilities. 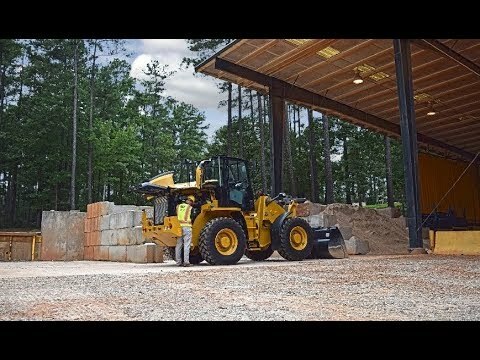 In certain applications, the loader's productive capabilities may exceed the tires' tonnes-km/h (ton-mph) capabilities. Note (3) Caterpillar recommends that you consult a tire supplier to evaluate all conditions before selecting a tire model. Caterpillar recommends that you consult a tire supplier to evaluate all conditions before selecting a tire model. Take a look at the 908M side by side with other models. Browse through these photos and videos for a closer look at the 908M and what it can do for your operation. Explore the 908M in all its glory through the best 3D and 360° experience in the industry. View key features and benefits and picture yourself in the machine at the jobsite before ever walking into a dealership. Wherever you want to go from here, the 908M is ready. You can get in touch with us in a variety of ways. Check out our inventory of new, rental and used equipment. Connect with your local dealer, ask our experts for advice or read what's happening in the customer forums.